Pressure washers are amazingly handy tools. They work by forcing water at extremely high pressure across the surface that you need to deep clean, a technique that's eco-friendly, fast, and suitable for many outdoor maintenance jobs. It saves time and effort, and is suitable even for homeowners with physical limitations like arthritis. A pressure washer can be used on your home's exterior, patio or deck, sidewalk, driveway, garage doors and flooring, swimming pool surround, vehicle or boat, outdoor furniture, gutters, stairs, or fence … the possibilities are almost endless. If you anticipate using a pressure washer frequently, you might want to go ahead and buy one. Otherwise, they may be rented for periods of half a day or longer. Choose a light, medium, or heavy-duty model, categorized in terms of PSI (pounds per square inch), according to the type of job you are planning and how often you will be using the machine. The cold water variety is excellent for removing dirt or stripping paint, while the more expensive hot water type is the best for dealing with greasy grime and is generally faster and more efficient. 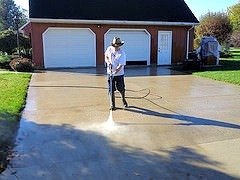 A pressure washer may be fueled by gasoline or electricity; the former kind is easy to move around to different locations, while the latter tends to be more compact. All of these kinds of pressure washers are easy to use and do not require complex set-up -- they can simply be connected to your garden hose. The cost to purchase a pressure washer ranges from under a hundred dollars to about 5000 dollars, depending on quality, PSI, and fuel source. You MUST make sure that you know how to operate and maintain the pressure washer before you switch on its power source -- read the manufacturer's instructions carefully. Wear old clothes and sturdy closed shoes; protective clothing, gloves, and rubber boots are necessary when operating a hot water pressure washer. Protect your face with goggles from flying chips of paint and other debris. If you are going to clean the exterior of your home, close and lock all windows. Standing on a ladder while using the tool is dangerous; instead, stand on the ground and direct the spray upward. Be careful what you spray with a pressure washer, as it can be dangerous for certain substances like brick or tile due to the high pressure involved. Test a small area first, using the least powerful nozzle. Keep the spray away from both human beings and animals and never allow children to operate the washer. Avoid spraying window glass, electrical wires, and shrubbery. Verify that the pressure washer is properly connected to the water supply before you turn on its power to prevent damage to the pump. In addition to being efficient, pressure washing is green. The high powered water spray deep cleans without requiring the use of environmentally dangerous chemicals. It consumes up to 80 percent less water than cleaning with a conventional garden hose. Pressure washing is an excellent, chemical-free means to rid your home and grounds of mold, bacteria, and algae, making for a safer, healthier environment, especially for family members who suffer from allergies. The electrically powered type is more eco-friendly than gasoline, as it doesn't burn fossil fuels and produce greenhouse gas. The energy cost to operate an electric pressure washer is minimal, only about 10 cents per hour. Best of all, you will save materials and labor by thoroughly washing items, rather than replacing them with new ones. Pressure washing your home's exterior not only adds a sparkling clean look, it also adds curb appeal and boosts the potential selling price of your home.